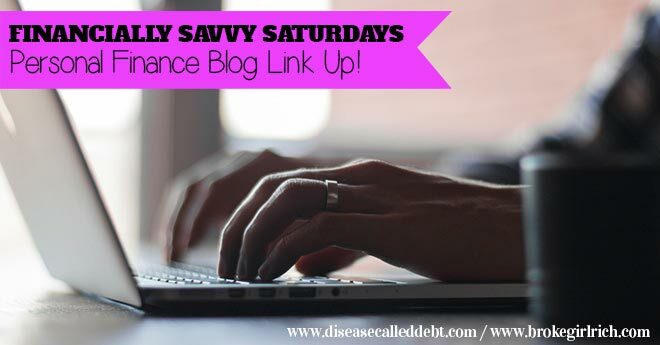 Welcome to Financially Savvy Saturdays, a blog link up created just for personal finance bloggers! We want to read anything to do with personal finance here. 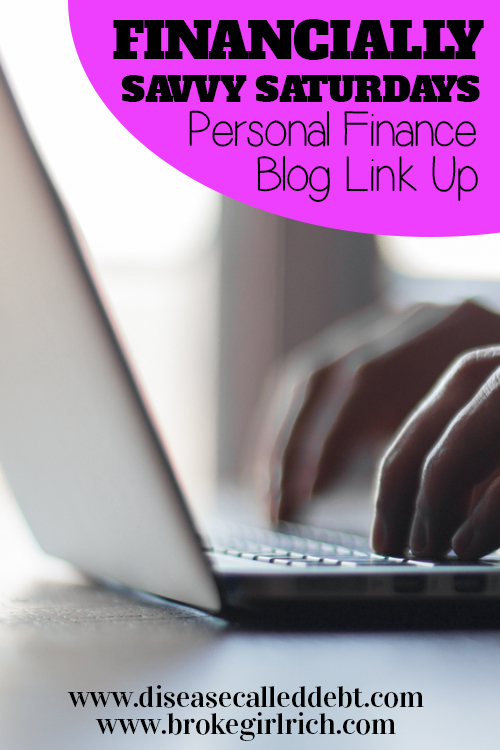 Whether you’ve written anything from reviews of the best money making apps to which savings accounts will rack up the highest interest rates, you’re invited to link-up. This weekend, we’re excited to welcome Miss Thrifty as our visiting co-host. Miss Thrifty blogs over at Thrifty Meets Spendy, where she writes about life when financial opposites attract. As this week’s visiting co-host, Miss Thrifty has selected the feature of the week from last week’s blog hop to be this week’s feature – Craziest Impulse Buys: You’re In Good Company by Heather at Simply Save. 3. Follow your hosts. You can follow brokeGIRLrich on Google+, Facebook, Twitter, Pinterest, OR by subscribing to her RSS feed and Disease Called Debt on Google+, Facebook, Twitter, Pinterest, OR by subscribing to her RSS feed. Also, you can follow Thrifty Meets Spendy on Twitter, Pinterest or Facebook. I have had such a great time co-hosting this week! I read each and every word of every post. What an inspiring group we have here, so may different perspectives! I felt like I learned more in reading about the blogger’s personal experiences, philosophies, anecdotes, successes, failures, etc. than any book I’ve ever read. I look forward to sharing my faves from this link up all week long. Can’t wait for the next #finsavsat!